See, it’s funny because I’m going to be boring again. Controversial opinions can be powerful. Maybe…too powerful? I am full of opinions! Controversial opinions! All the other webcomic folks always talk about the hate mail and vitriol they seem to receive, and my readers always seem to be supremely nice. Am I doing something wrong? Maybe I should start being more controversial. 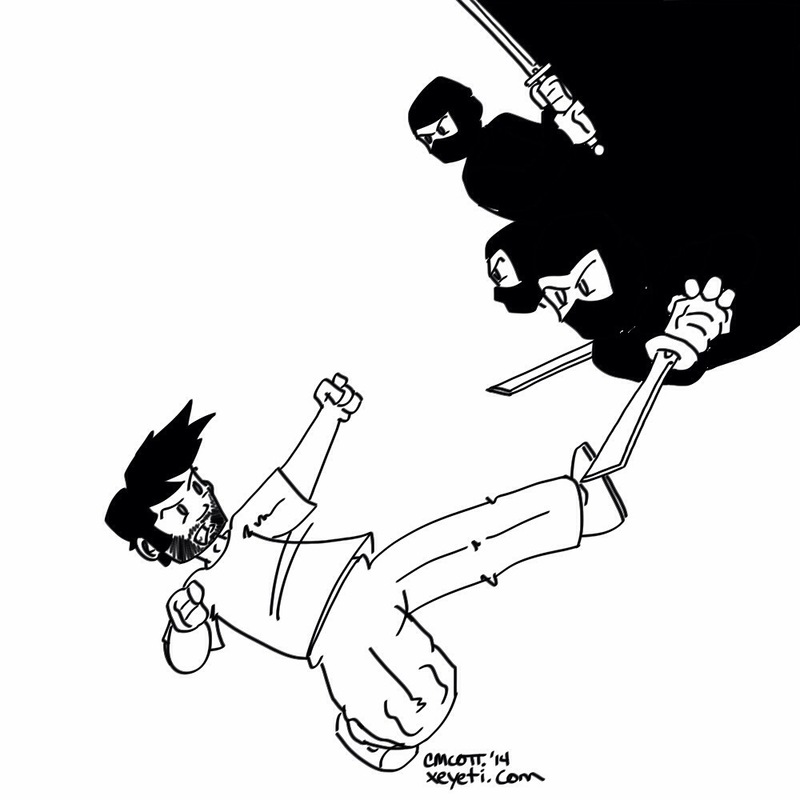 Weekend Update #60 – Ninjas! Man, it never fails. You’re out minding your own business, then – bam! – ninjas. Every freakin’ time. Does this happen to anyone else? Or am I just yawning too hard? As I write this, I’m sitting in an airport in Dallas, TX, making my return to northern Virginia and home. The past fee days have been spent mourning the loss of my great aunt, Gail Roork, with my family. One thing I’ve always noticed about funerals – at least, with my family – is that the great majority of time is spent not crying, but laughing. We celebrate the deceased’s life. And that’s what we’ve done in this case. That being said, we are still sad, and seeing me catch a pie in the face would make just about anyone smile, I’m pretty sure. Edited to correct horribly glaring spelling/grammar mistake in the second panel. Ugh. Sorry about the lack of update today. I’ve had to rush to Beaumont, TX, for a funeral. I’m in a place with pretty poor cell reception, to say nothing of actual wifi. There’ll be a brief hiatus until I get home Wednesday evening.